As their captive I was taken to the dead city of Thark, and there I watched an aerial battle between a fleet of mighty ships. From one of these vanquished craft the Green Men captured Dejah Thoris, Princess of Helium-—a wonderfully beautiful maiden with whom I at once fell in love. Desperately determined to escape from our captors, Dejah Thoris and I, accompanied by Sola, Dejah’s Tharkian attendant, broke away from the city in the dead of night. We were pursued by the Green Men, but I held off the enemy in a narrow mountain defile while Dejah escaped. Later I was captured and imprisoned, but once again managed to escape and after days of wandering I stumbled upon an immense building which I afterward learned was the atmosphere factory which supplied the air that made it possible for life to on Mars. Escape from the Factory CAUTIOUSLY I opened the door of my apartment and, followed by Woola, sought the inner of the great doors. A wild scheme had come to me; I would attempt to force the great locks by the nine thought waves I had read in my host’s mind. I stole stealthily from my hiding place and crossed to the great door, the inner of the three which stood between me and liberty. Concentrating my mind upon the massive lock I hurled the nine thought waves against it. In breathless expectancy I waited, when finally the great door moved softly toward me and slid quietly to one side. One after the other the remaining mighty portals opened at my command. When they had heard my story—I omitted all reference to Dejah Thoris and the old man of the atmosphere plant—they advised me to color my body to more nearly resemble their own race and then attempt to find employment in Zodanga, either in the army or the navy. The brothers had supplied me with a reddish oil with which I anointed my entire body and one of them cut my hair, which had grown quite long, in the prevailing fashion of the time. In the City of Zodanga WHEN I mentioned my inability to repay them for their kindness to me they assured me that I would have ample opportunity if I lived long upon Barsoom, and bidding me farewell they watched me until I was out of sight upon the broad white turnpike. Ten days after leaving the three Ptor brothers I arrived at Zodanga. From the moment that I had come in contact with the red inhabitants of Mars I had noticed that Woola drew a great amount of unwelcome attention to me, since the huge brute belonged to a species which is never domesticated by the red men. I could not permit even Woola’s life to threaten the success of my venture, much less his momentary happiness, for I doubted not he soon would forget me. And so I bade the poor beast an affectionate farewell, promising him, however, that if I came through my adventure in safety that in some way I should find the means to search him out. The letter I bore from them gained me immediate entrance to the vast, walled city. It was still very early in the morning and the streets were practically deserted. The residences, raised high upon their metal columns, resembled huge rookeries, while the uprights themselves presented the appearance of steel tree trunks. Like lightning he wheeled and before I could so much as lower my hand the point of his longsword was at my breast. 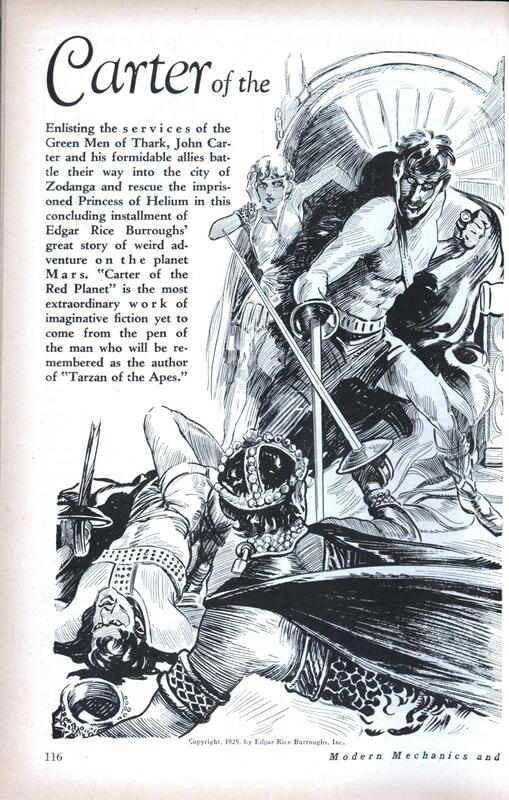 “Who are you?” he growled, and then as a backward leap carried me fifty feet from his sword he dropped the point to the ground and exclaimed, laughing, “I do not need a better reply; there is but one man upon all Barsoom who can bounce about like a rubber ball. “You gave me a bad half minute, my friend,” he continued, after I had briefly outlined my adventures since parting with him in the arena at Warhoon. “Were my name and city known to the Zodangans I would shortly be sitting on the banks of the lost sea of Korus with my revered and departed ancestors. I am here in the interests of Tardos Mors, Jeddak of Helium, to discover the whereabouts of Dejah Thoris, our princess. Sab Than, prince of Zodanga, has her hidden in the city and has fallen in love with her. His father, Than Kosis, Jeddak of Zodanga, has made her voluntary marriage to his son the price of peace between our countries. The plaza was now commencing to fill with people going and coming upon the daily activities of their duties. The shops were opening and the cafes filling with early morning patrons. Kantos Kan led me to one of these gorgeous eating places where we were served entirely by mechanical apparatus. After our meal. Kantos Kan took me with him to the headquarters of the air-scout squadron and introducing me to his super- ior asked that I be enrolled as a member of the corps. In accordance with custom an examination was necessary, but Kantos Kan had told me to have no fear on this score as he would attend to that part of the matter. He accomplished this by taking my order for examination to the examining officer and representing himself as John Carter. The next few days were spent by Kantos Kan in teaching me the intricacies of flying and of repairing the dainty little contrivances which the Martians use for this purpose. 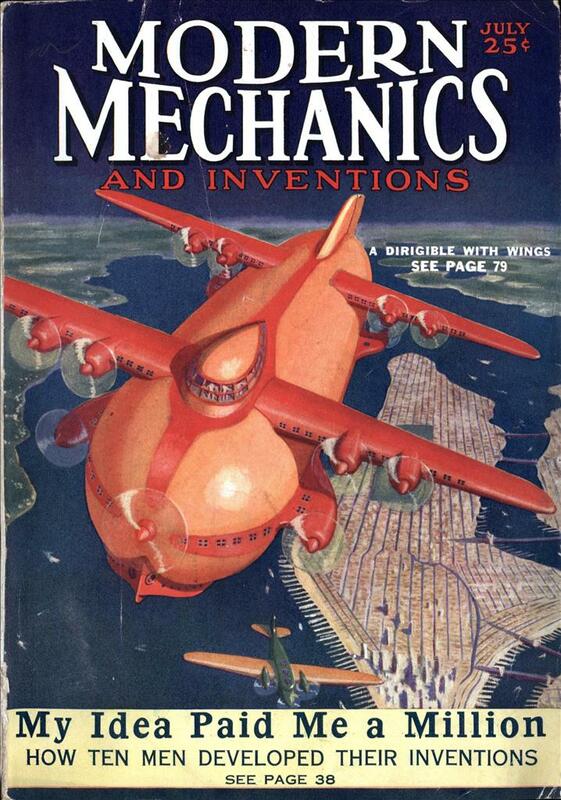 The body of the one-man air craft is about sixteen feet long, two feet wide and three inches thick, tapering to a point at each end. The driver sits on top of this plane upon a seat constructed over the small, noiseless radium engine which propels it. Battle in the Air THE fourth day after my arrival at Zodanga I made my first flight, and as a result of it I won a promotion which included quarters in the palace of Than Kosis. Driving my fleet air craft at high speed directly behind the warriors I soon overtook them and without diminishing my speed I rammed the prow of my little flier between the shoulders of the nearest. The impact, sufficient to have torn through inches of solid steel, hurled the fellow’s headless body into the air over the head of his thoat, where it fell sprawling upon the moss. The mounts of the other two warriors turned squealing in terror, and bolted in opposite directions. Reducing my speed I circled and came to the ground at the feet of the astonished Zodangan. We wasted no time in talk as we knew that the warriors would surely return as soon as they had gained control of their mounts. My companion signaled that I slow down, and running his machine close beside mine suggested that we approach and watch the ceremony, which, he said, was for the purpose of conferring honors on individual officers and men for bravery and other distinguished service. He then unfurled a little ensign which denoted that his craft bore a member of the royal family of Zodanga, and together we made our way through the maze of low-lying air vessels until we hung directly over the jeddak of Zodanga and his staff. The major-domo to whom I reported had been given instructions to station me near the person of the jeddak, who, in time of war, is always in great danger of assassination. The walls of the apartment were completely hung with splendid tapestries which hid any windows or doors which may have pierced them. My guide drew aside one of the tapestries, disclosing a passage which encircled the room, between the hangings and the walls of the chamber. Within this passage I was to remain, he said, so long as Than Kosis was in the apartment. When he left I was to follow. I Seek the Princess THUS was the edifice of my brief dream of happiness dashed, broken, to the ground of reality. The woman for whom I had offered my life, and from whose lips 1 had so recently heard a declaration of love for me, had lightly forgotten my very existence and smilingly given herself to the son of her people’s most hated enemy. Although I had heard it with my own ears I could not believe it. I must search out her apartments and force her to repeat the cruel truth to me alone before I would be convinced, and so I deserted my post and hastened through the passage. behind the tapestries toward the door by which she had left the chamber. Slipping quietly through this opening I discovered a maze of winding corridors, branching and turning in every direction. Moving on a few steps I discovered a passage-way at the end of which lay a door. Walking boldly forward I pushed into the room only to find myself in a small ante chamber in which were the four guards who had accompanied her. One of them instantly arose and accosted me, asking the nature of my business. “And your order?” asked the fellow. I did not know what he meant, but replied that I was a member of The Guard, and without waiting for a reply from him I strode toward the opposite door of the ante chamber. For reply he whipped out his own sword, calling to the others to join him, and thus the four stood, with drawn weapons. Finally a lucky cut brought down a second guardsman and then, with only two opposing me, I changed my tactics and rushed them down after the fashion of my fighting that had won me many a victory. The third fell within ten seconds after the second, and the last lay dead upon the bloody floor a few moments later. I knew that my only hope lay in escape from the city of Zodanga, for the matter of the four dead guardsmen would have to be explained. Presently I came upon a spiral runway leading to a lower floor, and this I followed downward for several stories until I reached a doorway. Without effort at concealment I hastened to the vicinity of our quarters, where I felt sure I should find Kantos Kan. My only means of reaching, unseen, the upper story where our apartments were situated was through an adjoining building, and after considerable maneuvering I managed to attain the roof of a shop several doors away. Leaping from roof to roof, I soon reached an open window in the building where I hoped to find the Heliumite, and in another moment I stood in the room before him. “How well are the machine sheds at the barracks guarded?” I asked. It was a long climb up the face of the building, and one fraught with much danger, but there was no other way, and so I essayed the task. I found ornamental ledges and projections which fairly formed a perfect ladder for me all the way to the eaves of the building. Here I met my first real obstacle. The eaves projected nearly twenty feet from the wall to which I clung, and though I encircled the great building I could find no opening through them. Clinging to the wall with my feet and one hand, I unloosened the long leather straps of my trapping at the end of which dangled a great hook by which air sailors are hung to the sides and bottoms of their craft for various purposes of repair. I swung this hook cautiously to the roof several times before it finally found lodgment; gently I pulled on it to strengthen its hold, but whether it would bear the weight of my body I did not know. An instant I hesitated, and then, releasing my grasp upon the supporting ornament, I swung out into space at the end of the strap. Clambering quickly aloft I grasped the edge of the eaves and drew myself to the surface of the roof above. Donning my trappings and weapons I hastened to the sheds, and soon had out both my machine and Kantos Kan’s. Making his fast behind mine I started my engine, and skimming over the edge of the roof I dove down into the streets of the city far below the plane usually occupied by the air patrol. In less than a minute I was settling safely upon the roof of our apartment beside the astonished Kantos Kan. I lost no time in explanations, but plunged immediately into a discussion of our plans for the immediate future. It was decided that I was to try to make Helium while Kantos Kan was to enter the palace and dispatch Sab Than. If successful he was then to follow me. He set my compass for me, a clever little device which will remain steadfastly fixed upon any given point on the surface of Barsoom, and bidding each other farewell we rose together and sped in the direction of the palace which lay in the route which I must take to reach Helium. As we neared the high tower a patrol shot down from above, throwing its piercing searchlight full upon my craft, and a voice roared out a command to halt, following with a shot as I paid no attention to his hail. Kantos Kan dropped quickly into the darkness, while I rose steadily and at terrific speed raced through the Martian sky followed by a dozen of the air-scout craft which had joined the pursuit. As I sped through the air the screeching of the bullets around me convinced me that only by a miracle could I escape, but the die was cast, and throwing on full speed I raced a straight course toward Helium. Gradually I left my pursuers further and further behind, and I was just congratulating myself on my lucky escape, when a well-directed shot from the cruiser exploded at the prow of my little craft. How far I fell before I regained control of the plane I do not know, but I must have been very close to the ground. Rising again I scanned the heavens for my pursuers, and finally making out their lights far behind me, saw that they were landing, evidently in search of me. Not until their lights were no longer discernible did I venture to flash my little lamp upon my compass, and then I found to my consternation that a fragment of the projectile had utterly destroyed my only guide, as well as my speedometer. Helium lies a thousand miles southwest of Zodanga, and with my compass intact I should have made the trip, barring accidents, in between four and five hours. As it turned out, however, morning found me speeding over a vast expanse of dead sea bottom after nearly six hours of continuous flight at high speed. I fell almost directly in the center of the fierce combat, among warriors who had not seen my approach so busily were they engaged in life and death struggles. I fell beside a huge monster who was engaged with three antagonists, and as I glanced at his fierce face, filled with the light of battle, I recognized Tars Tarkas the Thark. He did not see me, as I was a trifle behind him, and just then the three warriors opposing him, and whom I recognized as Warhoons, charged simultaneously. Quick as lightning they were upon him, and Tars Tarkas would have been gathered to his fathers in short order had I not sprung before his prostrate form and engaged his adversaries. I had accounted for one of them when the mighty Thark regained his feet and quickly settled the other. “And when you return, Tars Tarkas?” I asked. “The wild calots, possibly, or worse,” he replied. He no longer demurred when I suggested that we go before Tal Hajus, only saying that he would like to speak to Sarkoja first. At his request I accompanied him to her quarters. In silence we hastened to the jeddak’s chamber and almost at once we were admitted to his presence; in fact, he could scarcely wait to see me and was standing erect upon his platform glowering at the entrance as I came in. “Justice, Tal Hajus,” exclaimed Lorquas Ptomel. “Yes, justice!” echoed a dozen voices, and so, while Tal Hajus fumed and frothed, I continued. “Tal Hajus,” said Lorquas Ptomel in a cold, hard voice, “never in my long life have I seen a jeddak of the Tharks so humiliated. There could be but one answer to this arraignment. We wait it.” And still Tal Hajus stood as though petrified. It was a chance to fight, an opportunity to loot, and they rose to the bait as a speckled trout to a fly. In three days we were on the march toward Zodanga, one hundred thousand strong, as Tars Tarkas had been able to enlist the services of three smaller hordes on the promise of the great loot of Zodanga. When we came before Zodanga the task of obtaining entry to the city devolved upon me, and directing Tars Tarkas to hold his forces in two divisions out of earshot of the city, with each division opposite a large gateway, I took twenty dismounted warriors and approached one of the small gates that pierced the walls at short intervals. These gates have no regular guard, but are covered by sentries, who patrol the avenue that encircles the city just within the walls much as our metropolitan police patrol their beats. In this way, with ten warriors, I built a series of three steps from the ground to the shoulders of the topmost man. Then starting from a short distance behind them I i an swiftly up from one tier to the next, and with a final bound from the broad shoulders of the highest I clutched the top of the great wall and quietly drew myself to its broad expanse. After me I dragged six lengths of leather from an equal number of my warriors. These lengths we had previously fastened together, and passing one end to the topmost warrior I lowered the other end cautiously over the opposite side of the wall toward the avenue “below. No one was in sight, so, lowering myself to the end of my leather strap, I dropped the remaining thirty feet to the pavement below. Dispatching one of my men to Tars Tarkas for a detail of fifty Tharks, I ordered ten warriors to capture and open one of the great gates while with the nine remaining I took the other. We were to do our work quietly, no shots were to be fired and no general advance made until I had reached the palace with my fifty Tharks. Our plans worked to perfection. As we approached the palace I could see through the great windows of the first floor into the brilliantly illuminated audience chamber of Than Kosis. The immense hall was crowded with nobles and their women, as though some important function was in progress. At the foot of the throne came two figures entirely muffled in scarlet silk, so that not a feature of either was discernible. When the balance of the procession had entered and assumed their stations Than Kosis addressed the couple standing before him. I could not hear his words, but presently two officers advanced and removed the scarlet robe from one of the figures, and I saw that Kantos Kan had failed in his mission, for it was Sab Than, Prince of Zodanga, who stood revealed before me. Than Kosis now took a set of the ornaments from a salver and placed a collar of gold about his son’s neck. After a few more words addressed to Sab Than he turned to the other figure, from which the officers now removed the enshrouding silks, disclosing to my now comprehending view Dejah Thoris, Princess of Helium. The object of the ceremony was clear to me; in another moment Dejah Thoris would be joined forever to the Prince of Zodanga. With a bound I was on the steps of the platform beside Than Kosis, and as he stood riveted with surprise I brought my long-sword down upon the golden chain that would have bound Dejah Thoris to another. All eyes turned in the direction I had indicated, and there, forging through the portals of the entrance-way rode Tars Tarkas and his fifty warriors on their great thoats. As we circled upon the broad platform I saw Sab Than rushing up the steps to aid his father, but, as he raised his hand to strike, Dejah Thoris sprang before him and then my sword found the spot that made Sab Than jeddak of Zodanga. Calling to Dejah Thoris to get behind me I worked my way toward the little doorway back of the throne, but the enemy realized my intentions, and three of them sprang in behind me and blocked my chances for gaining a position where I could have defended Dejah Thoris against an army of swordsmen. The Tharks were having their hands full in the center of the room, and I began to realize that nothing short of a miracle could save Dejah Thoris and myself, when I saw Tars Tarkas surging through the crowd of pigmies that swarmed about him. The sounds of heavy firing, mingled with shouts and cries, came to us from the city’s streets, and Tars Tarkas hastened away to direct the fighting without. Dejah Thoris and I were left alone. She had sunk into one of the golden thrones, and as I turned to her she greeted me with a wan smile. Behind us we left the stricken city in the fierce and brutal clutches of some forty thousand greedy warriors of the lesser hordes. The vessels carrying our green warriors were kept circling above the contending fleets of Helium and Zodanga, since their batteries were useless in the hands of the Tharks who, having no navy, have no skill in naval gunnery. Their smallarm fire, however, was most effective, and the final outcome of the engagement was strongly influenced, if not wholly determined, by their presence. We signaled the flagship of Helium’s navy to approach, and when she was within hailing distance I called out that we had the Princess Dejah Thoris on board, and that we wished to transfer her to the flagship that she might be taken immediately to the city. The flagship bore down upon us, and as “she swung gracefully to and touched our side a dozen officers sprang upon our decks. As their astonished gaze fell upon the hundreds of green warriors, who now came forth from the fighting shelters, they stopped aghast. With the same polished courtesy that had marked their manner toward me they extended their greetings to the great Thark, nor, to my surprise, was he much behind them in ease of bearing or in courtly speech. We returned then to the palace of Helium. At the top of the great steps leading up to the main portals of the palace stood the royal party, and as we reached the lower steps one of their number descended to meet us. He was an almost perfect specimen of manhood; tall, straight as an arrow, superbly muscled and with the carriage and bearing of a ruler of men. I did not need to be told that he was Tardos Mors, Jeddak of Helium. We were then presented to Mors Kajak*. Jed of lesser Helium, and father of Dejah Thoris. He had followed close behind Tardos Mors and seemed even more affected by the meeting than had his father. He tried a dozen times to express his gratitude to me, but his voice choked with emotion and he could not speak, and yet he had, as I was to later learn, a reputation for ferocity and fearlessness as a fighter that was remarkable even upon war-like Barsoom. In common with all Helium he worshipped his daughter, nor could he think of what she had escaped without deep emotion.